Naagin 3 is topping the TRP charts ever since it started. The makers keep on introducing new twist and turns in order to keep the audience glued to the small screens. 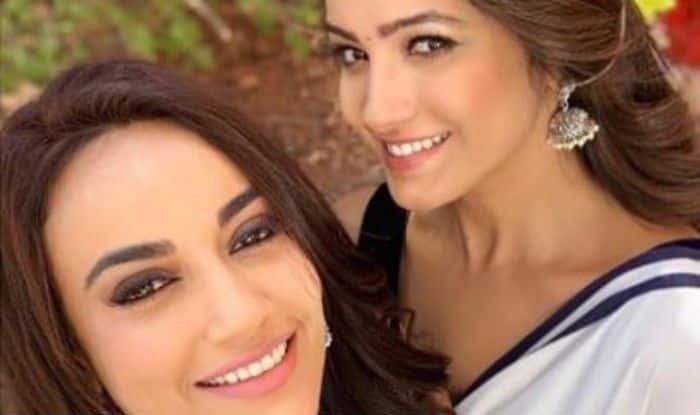 Television actors Anita Hassanandani and Surbhi Jyoti, who are being featured on Ekta Kapoor’s show Naagin 3, never miss an opportunity to take selfies while they are together on the set. Earlier today, Anita took to Instagram to share the picture with her co-star and friend Surbhi. Both the gorgeous ladies were seen dazzling in white saree. The matching makeup, hair and the saree give us major twinning goals. The photo has received more than one lakh likes and still counting. Anita is back to the bay after a relaxing Goa trip with husband Rohit Reddy. Earlier, she shared several pictures from the vacay and it gives us major couple goals. Anita flaunting her sartorial choices and fashion statement in western casual wear looks hot as she chills by the beach and Rohit is also seen donning casual attire as they visit cafes and the beach locations in Goa. Talking about Surbhi, she is winning hearts of her fans with her stint on the supernatural show. Recently, she treated her fans by flaunting her ‘Bella’ avatar in a white sheer outfit, matching maang tika and a pair of earrings. On the professional note, Anita is seen also seen playing the role of Shagun in Ekta Kapoor’s Yeh Hai Mohabbatein. It also features Divyanka Tripathi and Karan Patel.